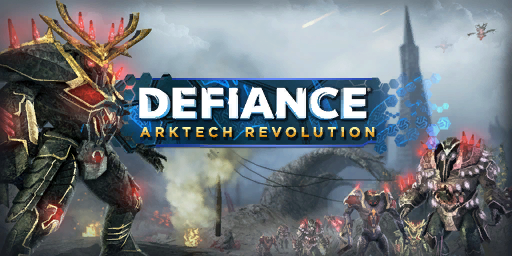 Arktech Revolution is the fifth DLC for Defiance and released April 15, 2014. 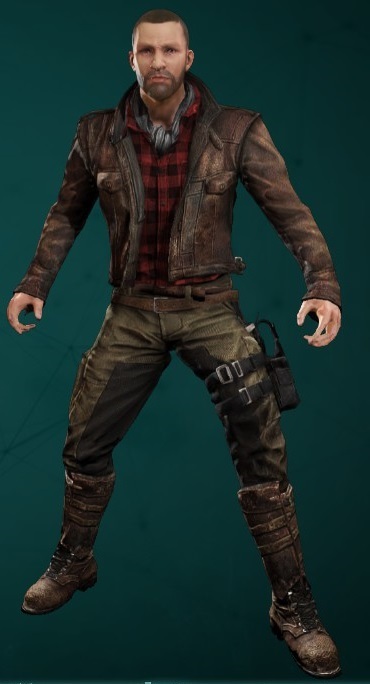 The Chimera Ark Hunter outfit. Access to the Chimera daily contracts which reward Caeruleum Cores for completing expert tier co-op maps. Caeruleum Cores can be acquired in lesser numbers from weekly Paradise contracts. A unique line of legendary weapons and legendary mods purchased using Caeruleum Cores. Six new pursuits offering unique titles and EGO rating increases that reward three pieces of legendary equipment. The Chimera Horn (rocket launcher). The Chimera Fang (charge blade). These perks will be locked to those who do not have the DLC. Conflagration: Increases damage to health from your incendiary attacks. Flash Point: Increases damage to shields from your incendiary attacks. Heat Shield: Reduces incoming damage from incendiary attacks. Corrosion: Increases damage to armor from your bio attacks. Virulent: Increases armor penetration from your bio attacks. Immunized: Reduces incoming damage from bio attacks. Bloodsucker: Increases health and shield damage stolen from your syphon attacks. Deadly Apparition: Increases damage from your syphon attacks. Strong Soul: Reduces incoming damage from syphon attacks. Live Wire: Increases damage to shields from your electric attacks. Electrical Fire: Increases damage to health from your electric attacks. Grounded: Reduces incoming damage from electric attacks. Gamma Rays: Increases armor penetration from your radiation attacks. Radiation Burns: Increases damage from your radiation attacks. Lead Lined: Reduces incoming damage from radiation attacks. As you can see, with Arktech Revolution a rating 50 weapon does not hold a candle to a rating 4000 weapon. In fact, your rating 4000 weapon can take out a standard Mad Mattock with a lone shot to the chest. Which brings us to our next major change: Scaling enemies. New Salvage Matrix option to increase a weapon or shields EGO Rating. Arkforge, a new currency available from lock boxes and events, can be used to increase a weapon or shield’s power rating, so you can level up your favorite gear. You’ll get 1,000 Arkforge as part of the Chimera Arktech Kit that comes with the purchase of Arktech Revolution. Arkforge is a new currency available from lock boxes and events that will power some new Salvage Matrix options in a similar way to Ark Salvage. Caeruleum Cores is a new currency rewarded from completing expert tier co-op maps and weekly Paradise contracts. They are used to purchase legendary equipment from the Chimera Faction vendor. Enemies will gain new stats, tactics, and appearances to match players new DPS potential. In addition to the difference between standard and elite enemies being more pronounced, new enemy difficulty tiers featuring enhanced abilities and updated designs will be introduced. More difficult enemies will now drop better loot. With all-new levels of raw power at your disposal, team up with your fellow ark hunters to tackle new expert versions of all co-op maps featuring the new enemy difficulty tiers! Defeating these challenging instances will not only reward you boasting rights but also new special tokens that can be spent to purchase legendary weapons and mods directly from certain vendors. Looking to mentor your lower-level friends returning to Defiance to sample the changes in Arktech Revolution? We got you (and them) covered! Events will now dynamically adjust their difficulty based on the players participating in or joining them. Enemies will not only adjust their levels and quantity but their difficulty tier as well with upgraded enemies changing how they look for easier identification. Low EGO rating players will be able to stand in fights with these high-level foes by means of a special temporary buff. Also launching with Arktech Revolution are advanced and expert level co-op maps, legendary weapons for sale from vendors, new perks and pursuits for DLC owners, and a raising of the EGO rating cap – one we’ve held back until the new progression system was ready to make it hugely worthwhile. Defiance’s weapons damage types are getting a major overhaul to increase their impact on gameplay. Incendiary: Deals increased damage to health and less to shields. Electric: Deals increased damage to shields and less to health. Syphon: Steals some health from shield damage and lots from health damage. Radiation: Deals a percentage of damage directly, bypassing armor plates. Bio: Deals increased damage to armor plates. Armor is a new damage-mitigating buff granted passively by shield equipment and temporarily by perks, stims, or spikes. The amount of armor plates is determined by the shield rarity. Unlike shields, armor does not regenerate when excessive damage breaks it but it can be repaired at extraction points or with a special stim. While temporary armor from spikes or perks does not stack and expires with the effect that granted it, it does stack with passive armor from your shield. Armor can be broken by dealing biological damage to them. Enemies will drop universal consumables (called “charges”) of each type that refill one use of the specificied item type in your current loadout. Can’t carry any more of that item? Don’t fret: you’ll automatically salvage any excess charges upon picking it up. Using the power of math, we’re creating an event “Threat Level” that scales content based on the number of participating players and their combined EGO rating. Boosts the minimum rating of all participants in an event (a boost that affects players and enemies alike). This may not make you equal to the content if you have a low EGO rating, but it will keep you from being wiped out by top-tier opponents. If anyone could help me with this I would really appreciate it. Just bought the Arktech Revolution pack, where is the Arkforge currency I. Must get with the pack? How do I get it now? It should be on your claims section in the box named Chimera Arktech Kit. So the enemies get cool new skins while all we get are crappy re-skins?